An expert in tailoring, Paddy Campbell presents the Channing Jacket, crafted from her iconic, luxurious and hard-wearing black wool crepe. Featuring a slightly longer line silhouette and subtle grosgrain trim, you'll find this jacket is a beautiful fit. 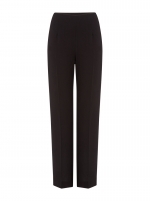 Mix and match with any of the black wool crepe dresses, skirts or trouser from the range.